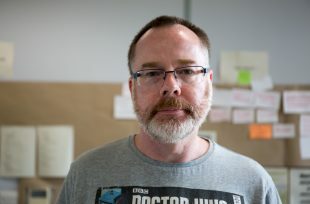 Hi, I’m Bryan Sharp, a Delivery Manager working in DWP Digital. My current role is with the Tax Credit Debt – Employer Payments Allocation Service. We’re coming towards the end of a Discovery Phase and I’m responsible for supporting the team on a day-to-day basis. Helping them to progress and remove any blockers. I manage activities such as the daily stand ups, stakeholder ‘Show and Tell’ reviews and team retrospectives. Having been with DWP all my working life, I’ve lots of experience. I’ve had a range of roles including working in our benefit offices and jobcentres, as well as corporate centre roles in strategy teams and project delivery. I’ve been working in digital project delivery for the last couple of years. In my current role we’re exploring how we can improve an existing process. This is where employers deduct money from an employee’s salary and then send it to DWP to help pay off a debt the employee has incurred. We’re talking to employers, payroll providers and payroll software providers to understand their user needs and importantly, if we need to provide a technical solution in order to improve things. We’re using Kanban to prioritise and manage activities. We’re also working with DWP colleagues to explore how things can be improved for them. I’ve also had some really interesting previous roles, including working on the ‘Repay My Debt Service’. I was very proud to be part of this work, which enabled people to go online and repay a debt with a debit or credit card. It sounds simple, but it was a big achievement as previously the only way an individual could pay by card was to call DWP and read out their card details! My most challenging role to date was to ensure that 381 local authorities across the UK were able to access the ‘Real Time Information Service’ The service allows Housing Benefit processing agents to check that claimants have declared their true income. It involved collaboration with BT, Vodafone, and the 381 individual local authorities IT teams. I also led the work with DWP Commercials to put a contract in place with a company that authenticates local authority users and managed the DWP developer activity, to ensure everything was joined up. I’m now looking forward to moving my current project into an alpha phase and being able to see how we can make a difference for the 88,000 employers, we ask to make deductions from their employee’s salaries. And, the DWP team tasked with reconciling the payments. If we’re successful we’ll also be making a difference for the 200,000 individual debtors this activity covers. However things turn out, I know it will continue to be an interesting time!